We offer people with a learning disability the opportunity to progress to more independent living, if they have developed their skills and confidence sufficiently and if they so wish. The Oaks and The Willows are two well appointed adjacent houses close to Scotts site, where our day services are delivered and our residential houses at St Peter's Row are sited. When writing about our service, we call our people 'service users' as this is what they have chosen to be called. Lee lives at the Oaks, enjoying all the facilities and groups in easy reach of his home. Almost every day Lee leaves for the day to enjoy a variety of activities, including cookery at Scotts on site development centre, just a short walk away, woodcraft at Horizons at the YMCA, drama at Trinity and pottery at Hadlow. He loves his room and has decorated it exactly how he wants it. In the summer Lee enjoys a bbq in the garden, socialising with his house mates. 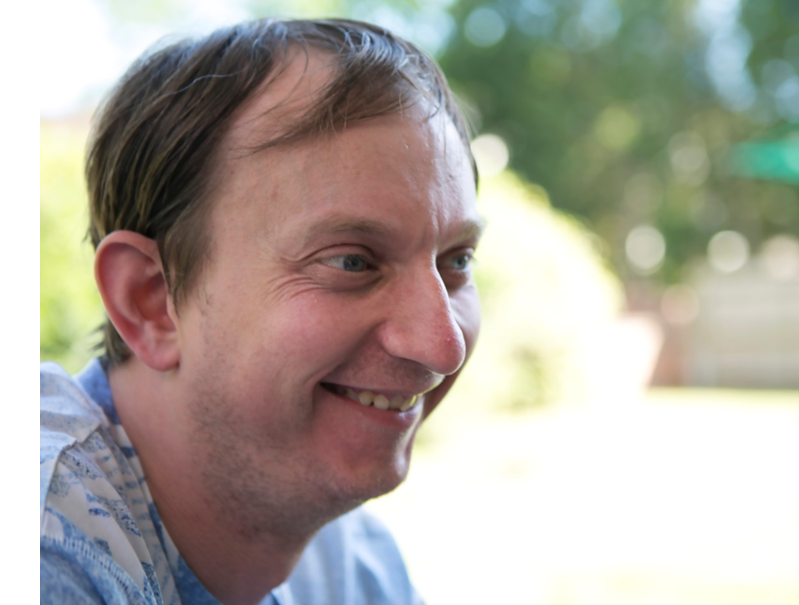 Pictured: Jon, one of our services users living at The Willows. 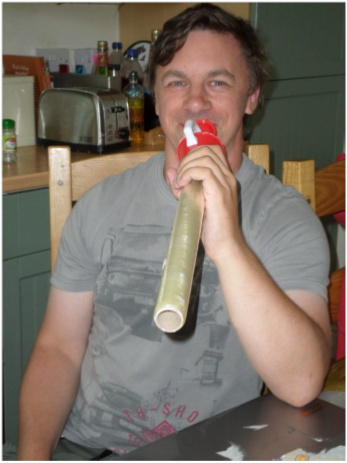 Jon loves music, this picture shows him sitting in the kitchen at the Willows, with a musical instrument he has just made with cling film and a kitchen utensil! He enjoys living at the Willows – residents have independence, but work together well with a rota for making dinner each night. Jon loves making smoothies. Jon has many interests, especially engines. He enjoys train spotting and is particularly keen on V8 engines. He is musical and attends a drumming club in Sevenoaks, getting there independently by train. Jon enjoys keeps in touch with his family by phoning them regularly and has a girlfriend. He uses social media to keep in touch with everyone. 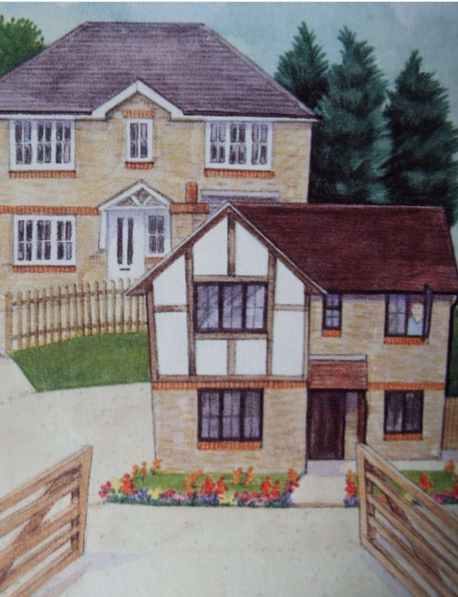 The houses are in easy reach of the bus stop, shops, post office, pub and church making it very easy for our people to travel and organise themselves. Each of our residents has a tenancy agreement covering their own bedroom and the sharing of a kitchen and living room. They also have a support plan which they are involved in preparing and updating, setting out the type and level of support needed to enable them to move on gradually to greater independence. Initially, service users tend to need support in many aspects of independent life such as decision making, menu planning, shopping, cooking, cleaning, attending medical appointments, accessing local services, finding part time employment, paying bills and dealing with their finances generally. An illustration of The Oaks and The Willows and the garden. We have a team of support staff whose aim is to help service users further develop their abilities and confidence while ensuring each has all the support he or she needs.